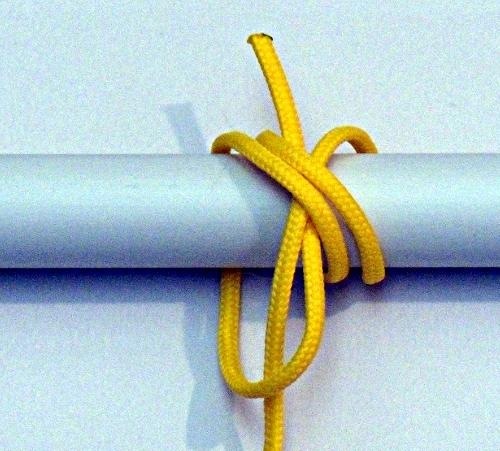 The Double Constrictor Knot is another very useful knot that should be in every boaters skill set and is quick and easy to tie. 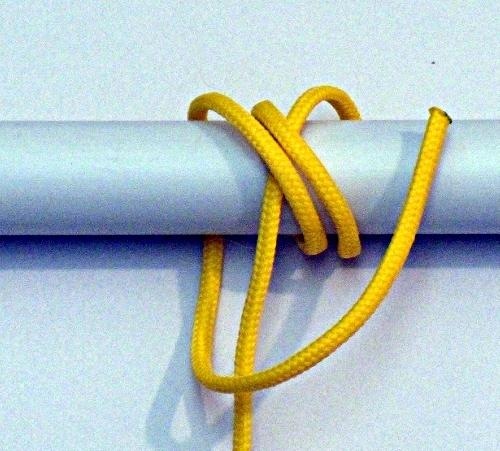 This knot can be used for emergency repairs and quick whipping on the end of a line to keep the line from unraveling until a permanent repair can be made. The Double Constrictor is a more powerful version of the Constrictor Knot The Double Constrictor is a binding knot that is difficult to untie, many times it needs to be cut off and can be tied either right or left handed.The Double Constrictor Knot can crush fragile objects..
Start a Double Constrictor the same as a plain Constrictor Knot with a turn around the object you are tying around. 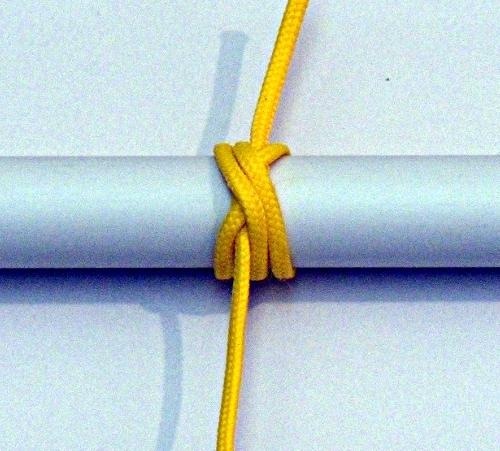 Continue around the object like you are making a Clove Hitch. Go twice around the object you are tying around with both turns going over the standing part of the line. After the second turn come up on the same side of the standing part of the line as the top of the coils. 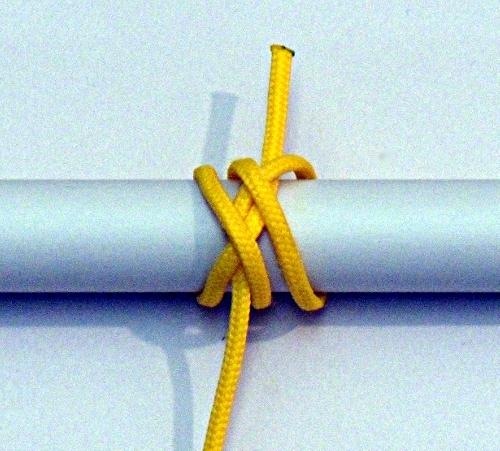 Tie a single overhand knot around the standing part of the line. 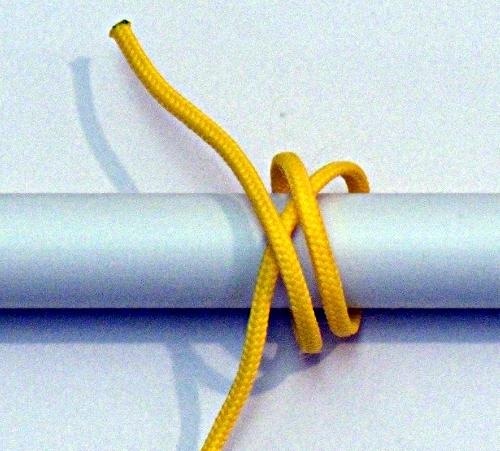 The overhand knot needs to be placed under the outer turns. The outer turns cinch down on the overhand knot and causes the Double Constrictor knot to bind. The Double Constrictor ready to tighten up. 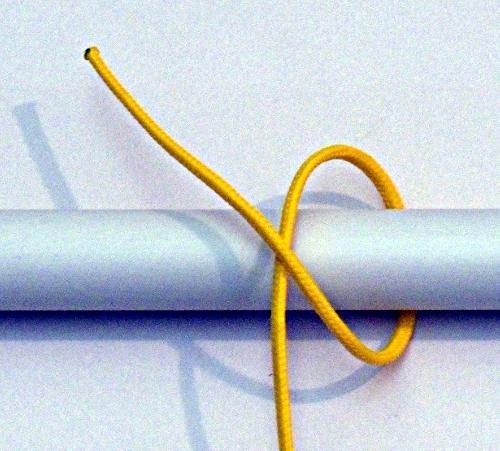 Move the turns together then pull firmly on the two ends to tighten the knot and you have a knot that will bind down onto what it is tied to. 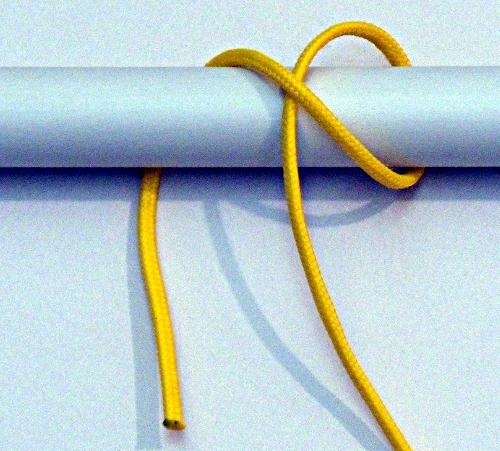 Wrap the ends around a marlinspike, screwdriver or other object to help you apply more tension to the knot without hurting your fingers. Finished Double Constrictor pulled tight. I use the Double Constrictor as a quick whipping for the ends of lines. Recently my neighbor had the end of one of his dock lines start to fray and unwind so I took a short piece of #16 heavy whipping twine, tied a Double Constrictor to keep the end of the line from fraying after I had wound the line back together (it is three strand line). I have also used Double Constrictor’s tied with 1/8 inch Dacron braided line on 1 1/2 inch three strand dock lines to keep the ends from unraveling. Reeving eyes in the end of messenger lines (I use 1/8 inch Dacron braided line on my boat) can also be made quickly by using several Double Constrictor’s to hold the loop together. The Double Constrictor is a great knot for temporary repairs, any application that requires pulling things together or clamping, hose clamps are one example (I have a sample of double braid (fabric braid) hose with a Double Constrictor knot tied around the hose with 1/16 inch nylon net twine and the net twine has crushed the hose down to the point that the net twine is flush with the outside of the hose. Over the years I have heard stories of booms, spinnaker poles, tiller extensions and tillers being repaired in part with Double Constrictor knots used to hold the repairs together. Wow — I did not know there was a doubled version of the constrictor. This is a good one, for sure.